The pads of a dog's paw are easily infected if left raw by constant chewing. To us, it's super icky to watch a dog chew on his paws. It can also be costly if the continued gnawing results in a veterinary visit. But for our four-legged friend, using his mouth to solve perceived trouble is standard operating procedure. 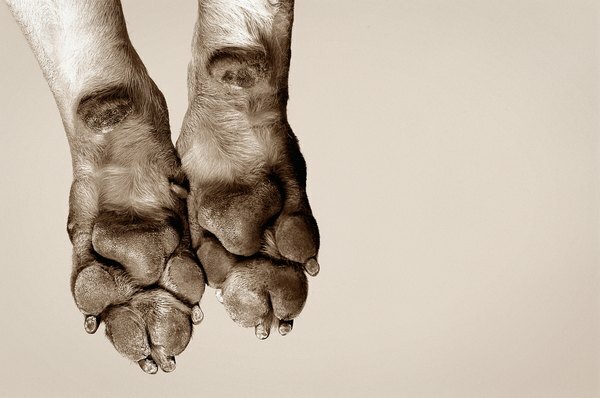 If your four-legged buddy is outside a lot without his doggie shoes, chances are pretty good he may be chewing at his paw because something got stuck between his toes during the last outing. If it is winter time with ice and snow on the ground, perhaps a small chunk of frozen stuff or salt got stuck. In fall, spring or summer months, a small stone or twig might be lodged where the movement of walking just did not force it out. Your pup may just be using his teeth to remove something that shouldn't be there. Fleas biting the tender skin between your dog's toes can cause itching similar to what humans experience with mosquito bites. According to the licking triggers section of the website Dog Paw Licking, pesticides and other lawn and garden products applied in areas where your four-legged friend is hanging out with you could be causing the skin of his feet to have an allergic reaction. Inside the house, floor cleaning products aimed at removing dirt and grime also have enzymatic agents that can irritate the skin of a dog's paws. Regularly washing your dog's feet to remove irritants might help reduce allergic reactions he wants to handle by chewing at his paws. Again, this goes back to the dog's natural instinct to use his mouth to cure anything that ails him. Dogs lick their wounds, and the same applies to an injury on a paw. Perhaps a minor cut or abrasion went unnoticed by his human companion and Fido has resorted to using his own saliva as a cure. Trouble is, a dog's mouth and teeth are chock-full of bacteria that aren't healthy for the broken skin usually caused by paw chewing. According to Mar Vista Veterinary Clinic, the wound resulting from excessive licking or gnawing is called a lick granuloma. It is a raised ulcerated area that is basically raw exposed skin. When a wound gets to this point, antibacterial treatment administered by a veterinarian is necessary. According to VetInfo, some veterinarians theorize that some dogs develop the habit of licking or gnawing on their paws to keep themselves occupied or to keep their minds off stressful or painful situations. It's like the human equivalent to chewing your nails. Maybe it's a self-soothing method. Maybe your dog is just bored and perhaps if you give him a new toy, he'll gnaw on that instead. According to VetInfo, the paw licking and gnawing easily becomes a vicious circle that a dog cannot seem to escape. Addiction to the behavior easily develops, as the release of stress-reducing endorphins that the dog has experienced in the past provides a sort of mental reward to the dog. Finding a replacement for that "high" is necessary. Options include toys or food treats. Having the dog wear socks can reduce his direct tactile contact with what his feet touch, thus reducing awareness of his feet. The only struggle with that, according to Dog Paw Licking, is that socks come off quickly. Also, some socks are colored with dyes that are just as irritating. Mar Vista Veterinary Clinic offers some recommendations for medications such as doggie Prozac.